After our trip out to the Blue Ghost Tunnel last time our backs were sore from standing so long. We had gone out and bought some camping stools and we had bought one for Cindy and her daughter as well. Cindy came over to our place and we gave her the stool. Cindy wanted to go out to the BGT again saying, "I won't end up with a sore back this time!" 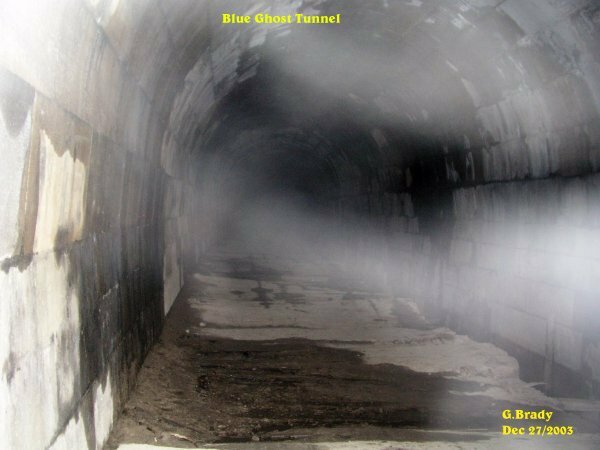 So after talking about our experiences there we decided to go back to the Blue Ghost Tunnel for another investigation. 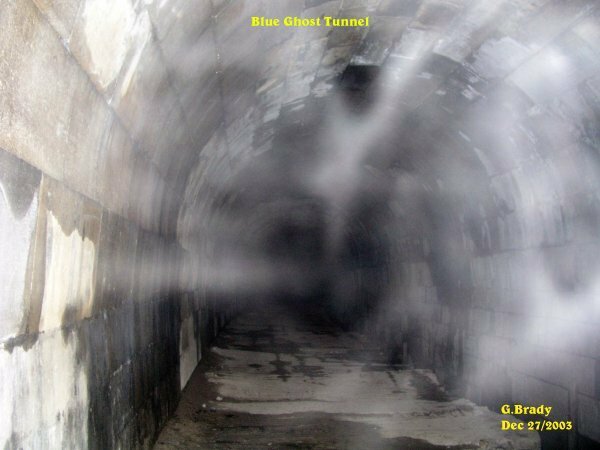 Cindy went on ahead of me and I took this picture showing a strange ecto energy form right near her as she was taking her picture in the tunnel. In the photo you can see the camping stool strapped to Cindy's back. This photo showed a strange ecto mist that was forming just ahead of me. 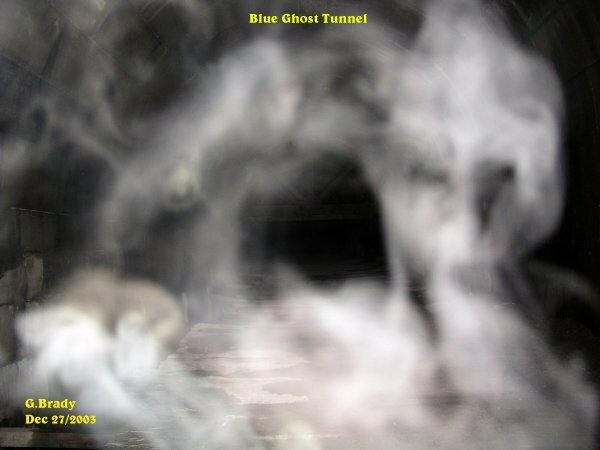 What was interesting about this photo was in the center of the mist it appears as though a lady was forming at the top, with dark hair. What we could not figure out was what this lady was riding on. I have drawn a circle around the figure to show what I see in the photo. Shortly after the previous photo, this showed up. Notice that in the center of the ecto mist it was very clear. I was not going to show this photo, but then I decided to show it anyway. 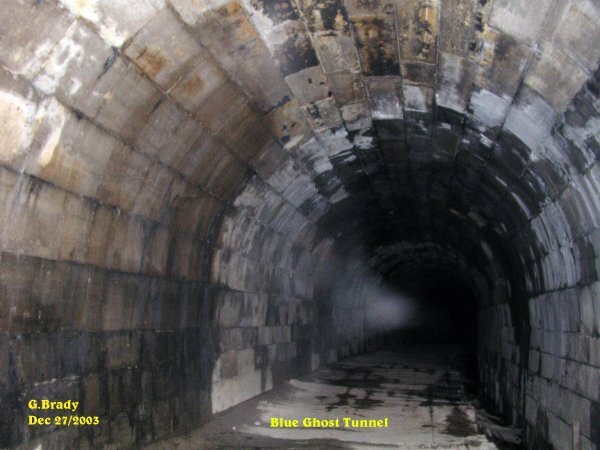 This photo was taken looking back to the entrance of the tunnel. There appears to be something in the distance coming into the tunnel. This was an interesting photo. 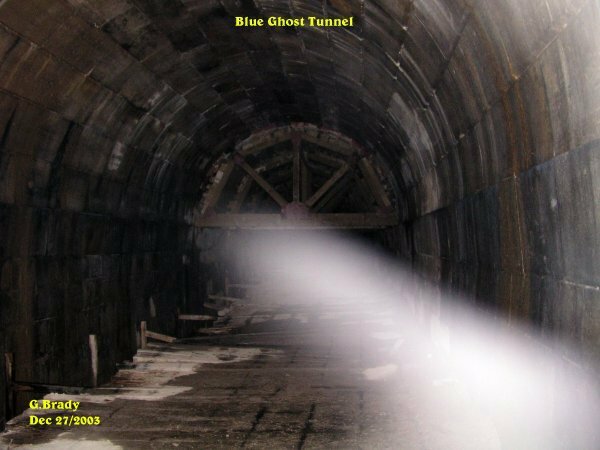 Notice how bright the ecto was near the beams that appear as a bright circle of light. Then the two other entities nearest the camera. 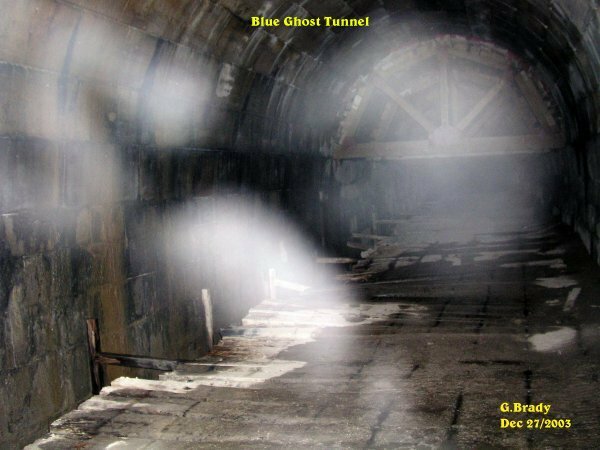 When we showed this picture to some of our friends they say it maybe the light from a ghost train that may have been coming from the other end of the tunnel. Near the support beams in the tunnel I took this picture. What caught my attention was the form of what appears to me as a mid size dog that was sitting up as if begging for a treat. I circled the picture of what I see. Was it in fact a dog ? I really could not say for sure, but it does look like a beagle type dog to me. Something was either coming towards me or something passing me in the tunnel. Whatever this was, it made itself known as indicated in this photo. 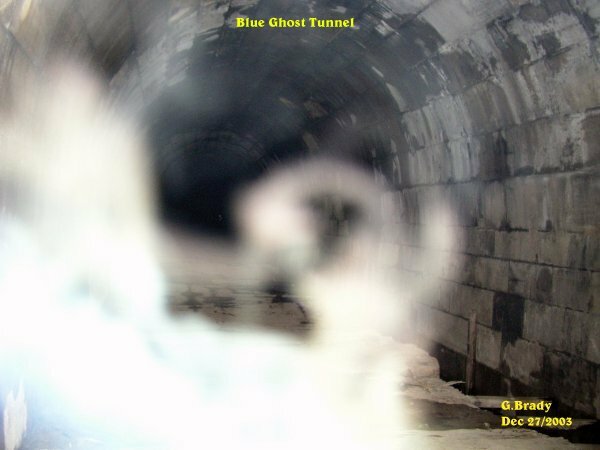 A large energy form that was taking on some shape in the tunnel. Notice the green and blue within the form. 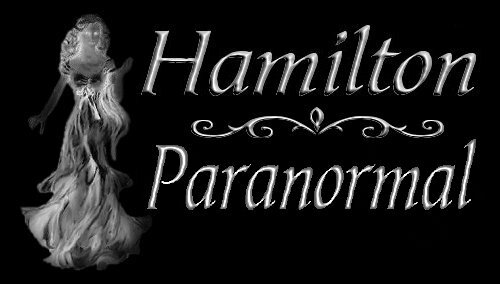 This spirit had a lot of energy to it, showing in very vibrant color. 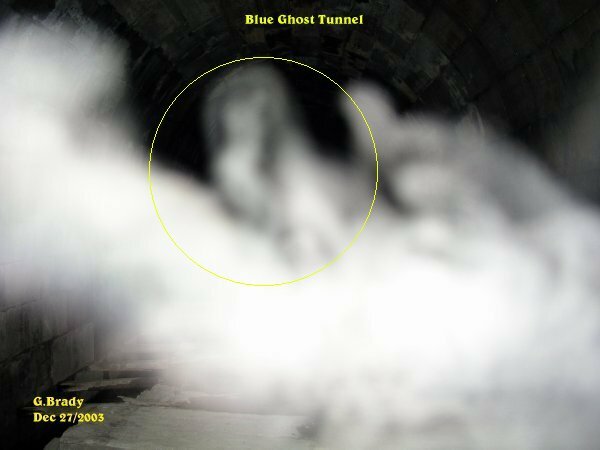 About 10 minutes later taking a photo from the same spot, I had captured the above entity. 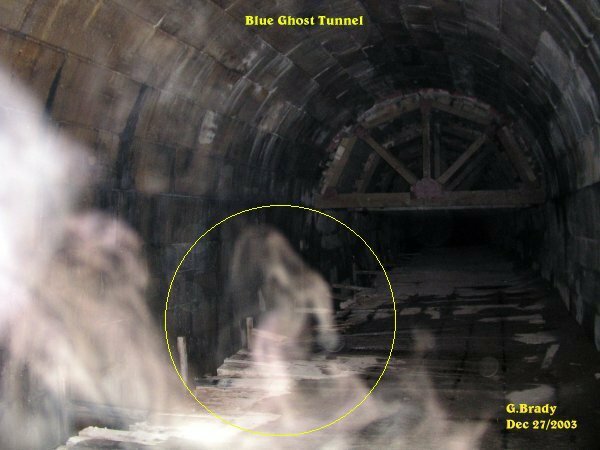 There seems to be more spirit activity in the tunnel coming from the entrance. 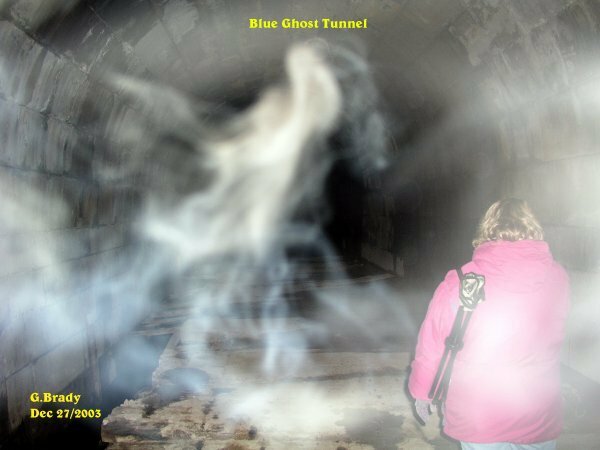 A few pictures later I caught another spirit moving around between me and the entrance of the tunnel.